Yeshua’s post-Resurrection appearances and personal, revelatory teachings all took place during the Counting of the Omer. We can still anticipate, by grace, fresh revelation of God in this special, 50 day count. What is the “Omer” and why do we count it? God commanded ancient Israel to count the omer, or measured sheaves of harvest, for each of the 50 days between the Sabbath of Passover and Shavuot (Leviticus 23:15-16). Today is Day 13 of that period of time. Rabbinic scholars differ as to the exact date the count begins and ends. But nearly all agree the omer count (Sefirat HaOmer) is to prepare us for a fresh revelation of – and encounter with – YHVH. Historically, Sifirat HaOmer was regarded in part as an agricultural holiday. Today it is generally observed by offering blessing and thanksgiving to God for past, present and future provision. A special prayer-proclamation is made each day. It simply states how many days are left until the 50th day, which represents the fullness of time: A traditional blessing is recited each day of Siferat HaOmer: “Blessed are You, Lord our God, King of the Universe, who sanctifies us by His commandments [you can substitute ‘the blood of Yeshua’] and commands us to count the omer. Today is day (1, 2, 3, etc.) of the omer count.” On the 50th day, Shavuot (Feast of Weeks) culminates the previous 49 days or 7 weeks. According to tradition, God gave Israel the gift of the Law (Torah) on Shavuot. While on Passover we were delivered, on Shavuot we were sanctified by His Word. We became more intimately His through an exchange of covenant vows (the Mosaic Law covenant). The relationship was intended to be similar to that of marriage. Sefirat HaOmer is meant to remind us – and revive in us – the reality of that relationship. We are to anticipate, by grace, even greater revelation of God upon the 50 day count. On another Shavuot, shortly after Yeshua ascended to heaven, God gave us the unparalleled gift of the indwelling Holy Spirit. The day is known as Pentecost. On Pentecost we were sanctified anew, not only by His Word but by His Spirit. Again there were covenantal vows between God and His people (the New Covenant). The New Covenant is gloriously more universal than the Mosaic covenant. It is a new type of marriage of Jews and Gentiles as a composite unity, in and to Messiah. Therefore, Pentecost is also the birth date of God’s called out ones, the ecclesia or Church. By the indwelling, empowering Holy Spirit, Jews and Gentiles may access even greater intimacy of relationship with Him. 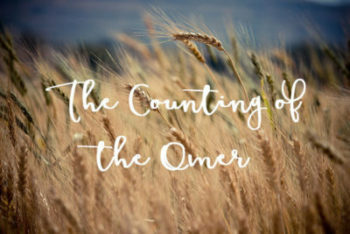 By counting the omer as One in Messiah, we posture our hearts to be reminded of – and revived in – our love relationship with Him. By grace, we anticipate and surrender ourselves to even more intimate revelation of God. This may explain why Yeshua’s 500 post-Resurrection appearances and personal, revelatory teachings – including the Emmaus Road miracle — all took place during Sefirat HaOmer. ( 1 Coriinthians 15:7) Moreover, it was not by mere happenstance that God restored Israel’s Indpendance 70 years ago during the omer count. This watershed prophetic event revealed and displayed the sovereignty of YHVH over all the earth. Does your heart seek hard after God? Would you cherish a personal “Emmaus Road” experience? If so, you might think about counting the omer this year – and making it count! Be greatly blessed! Your ticket for the: What is the Omer and Why Are Israelis Counting it Now?